How do National Australia Bank Foreign Exchange Rates Compare? Use the below live foreign transfer exchange comparison table that makes it easy to compare NAB exchange rates to the leading FX specialists. This example shows you the situation where you want to send $AUD 10,000 abroad, note the margins for the bank and brokers are compared to the current mid-rate. You can change the currencies and send or receive amount with our full NAB foreign transfers calculator. The below live NAB Travel Money comparison table shows how much you could save on your next foreign transfer or travel money purchase. This example shows you the situation where you want to change $AUD 2,000 for foreign cash, note the margins for the bank and brokers are compared to the current mid-rate. You can change the currencies and send or receive amount with our full NAB travel money calculator. Let’s now consider these in detail. As you can see, the value of 1AUD differs when converted to other currencies. For instance, 1AUD will fetch you 0.9245CAD, whereas the same 1AUD will fetch you only 0.5464GBP. This might be a bit confusing at the first glance. But, you need to know the rate of only the currency you’ll need for your travel. 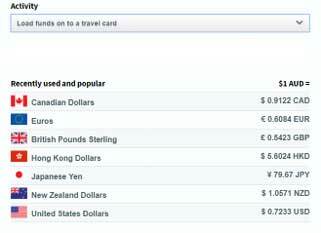 Hence, if you are travelling to Canada, you need to check the rate of the CAD alone. Similarly, for a trip to New Zealand, you need to check the rates of NZD only. Once you have found the correct currency, the next step is to find the rate relevant to your need. It is important to remember that banks charge different rates for different transactions. The buying rate would differ from the selling rate. For buying cash, you will have to refer to this chart. 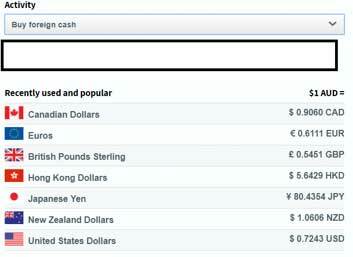 It means one AUD will fetch you 0.7243USD in cash. 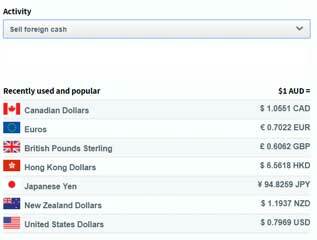 So, if you are selling your foreign currency, say USD, 0.7969USD will fetch you 1AUD. As you can see, this rate is slightly different from the buying rate. We have already seen the rates for hard cash in the tables elsewhere. When you compare, you’ll see that the rates differ according to the product you prefer. As well as NAB exchange rates, NAB Internet Banking can also be used for IMT and you can easily send money around the world in no time. In addition, this facility offers you the option of locking in your exchange rates day or night during a week. Now that we have understood the factors that affect exchange rates, it is time to do some calculations and find out how it works in real life situation. How much foreign currency will my Australian dollars fetch? What is the cost to buy a fixed amount of foreign currency? What is the cost if you send money overseas? As explained above, if you know the exact amount of money you want to send oversees, the calculation to be used is the same as buying travel money (The cost in Australian Dollar = the amount of currency you want to buy / exchange rate). What is the calculation while receiving currency from overseas? Foreign currency received/exchange rate = the amount of Australian Dollar you receive. Once you understand this fundamental idea, the rest becomes easy. However, remember that the actual amount you’ll receive will depend on the type of product too. So, if you buy a travel card, opt for IMT or exchange AUD for foreign currency in cash, there would be slight differences in the cost. Furthermore, you should always try to do currency exchange from branches than airports. Airports are generally costly when it comes to currency exchange. I was using my NAB account to send money home but found much better rates at OFX through this website thx!